In this section, you can learn about different integrations Zoho Books offers and how these integrations can be used for your business. 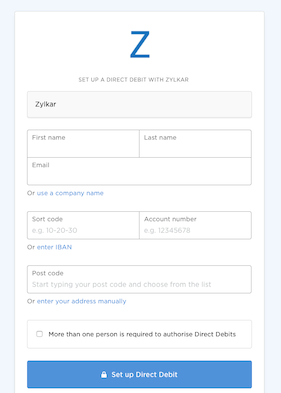 Zoho Books is integrated with major online payment gateways like PayPal, Authorize.Net, etc to help you receive payments for your invoices online. This ensures faster and hassle free receipt of payments and further automates your cash flow and its book keeping. You’ll find the list of payment gateways that Zoho Books supports. In this section you can configure the online payment settings linked to your Zoho Books account. To set them up, navigate to Settings icon and select Integrations. Choose Online Payments from the list. To setup PayPal as your preferred gateway for receiving payments, click on the Settings icon found on the top right hand side corner of the screen and click on More Settings. Go to Integrations and select Online Payments and click the Setup now button, listed adjacent to PayPal’s logo. Enter the following information and click Save. Registered email Address: Enter the email address using which you registered in PayPal. Re-enter the email Address: Re-enter the email address for confirmation. PayPal Standard: Choose this mode of payment to transact with your clients from across the globe. Your clients can pay you with a credit card even if they don’t have a PayPal account. You receive your payments instantly. 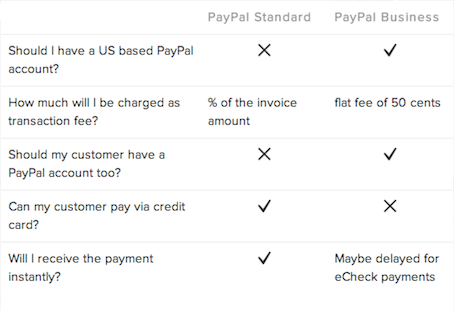 In PayPal standard, a percentage is charged as the transaction fee. PayPal Business Payments: Regardless of your invoice amount, the transaction fee charged by PayPal is just 50 cents. Your clients however can make payments only via an eCheck or PayPal balance. The payment may be delayed if the payment is received via eCheck. In this mode of payment, both you and your clients need to have a US PayPal account. To help you decide which of the Payment Options work for you, click on the grey question mark icon next to the Default Payment Options field to see the comparison between the two. Bank Account: Enter the Bank Account where money received should reflect. 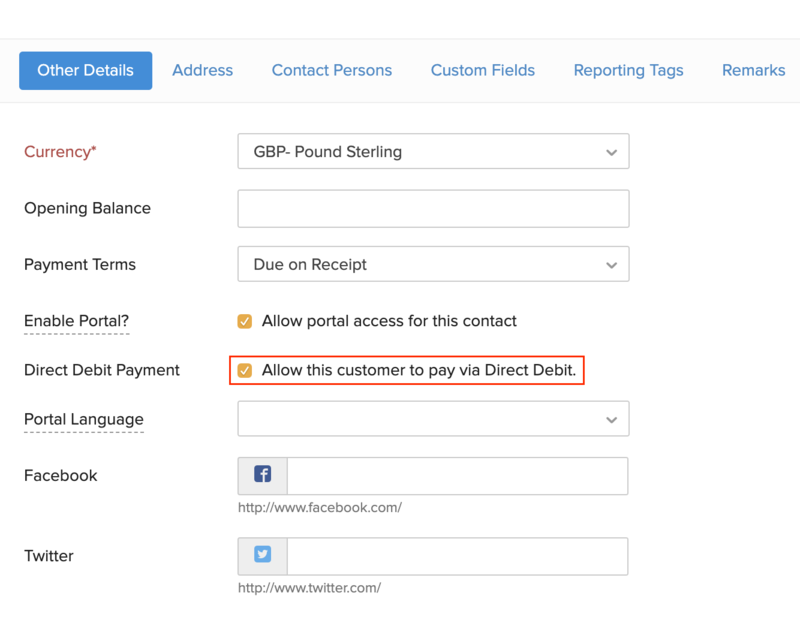 Page Style: Enter the layout of the payment page, that your customers see. Please note that this option is available only for PayPal Standard users. Click here for more on PayPal’s page style option. When you setup this integration, your email address will be shared with Paypal. The online transaction fees will depend upon the charges specified by PayPal. To configure Authorize.Net, click on the Gear icon found on the top right hand side corner of the screen. Go to Integrations and select Online Payments and click the Setup now button, listed adjacent to Authorize.Net’s logo. Enter the following information and click Save. API LoginID: Enter the API Login ID given to you by Authorize.Net. Transaction Key: Enter the Transaction Key given to you by Authorize.Net. More information on API Login ID and Transaction Key can be found by clicking here. 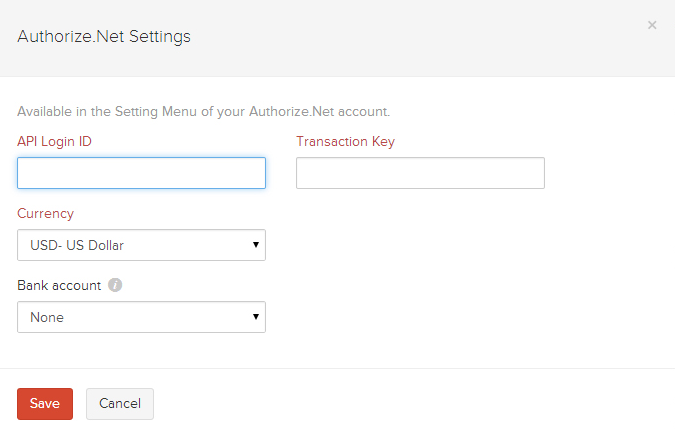 When you setup this integration, your API Login ID and Transaction Key will be shared with Authorize.Net. Customers should have an active Authorize.Net account. This account should have been selected with Card Not Present option during account creation. Only on the above criteria, the customer will be able to view the CIM (Customer Information Manager) feature in their merchant account. CIM needs to be enabled. Once enabled, it will take 24-48 hours for a transaction to happen. Do not enable ARB (Auto Recurring Billing) feature provided in Authorize.Net. Tip - Countries supported by Authorize.net: United States, United Kingdom, Europe, Australia, Canada. The online transaction fees will depend upon the charges specified by Authorize.Net. To set up Payflow Pro, click on the gear icon on the top right hand side corner of the screen. Go to Integrations and select Online Payments and click the Setup Now button adjacent to Payflow Pro logo. Enter the following information and click Save. When you register for Payflow Pro, you will receive an email with information like your Partner ID and Vendor name. Please keep that email at hand while filling the details for Payflow Pro. Then enter the following information and click Save. Currency: The currency you set up in your Payflow Pro account. Payflow currently supports transaction in 10 leading currencies. Partner: The partner ID as mentioned in your Payflow Pro account. Vendor: Your vendor name as mentioned in your Payflow Pro account. User: Enter your Payflow Pro username. Password: Enter your Payflow Pro password. When you setup this integration, the fields mentioned above will be shared with Payflow Pro. Tip - Countries supported by Payflow Pro: United States, United Kingdom Canada, Australia, New Zealand. The online transaction fees will depend upon the charges specified by Payflow Pro. To set up Payments Pro, click on the gear icon on the top right hand side corner of the screen. Go to Integrations and select Online Payments and click the Setup Now button adjacent to Payments Pro logo. Enter the following information and click Save. Login to your PayPal account. Go to Profile and click Request API Credentials under Account Information. 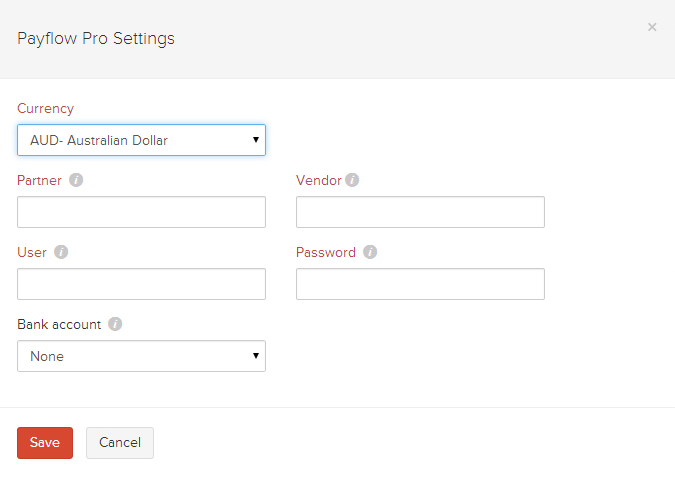 Choose Set up PayPal API Credentials and Permissions under Option 1. Copy the API Username, API password and Signature into corresponding fields in Zoho Books. When you setup this integration, your API credentials and Signature will be shared with Payments Pro. In order to use PayFlow Pro for Auto-charge, you need to enable Reference transactions in their merchant account. Navigate to Manage Security -> Transaction Settings and enable Allow reference transactions. Tip - Countries supported by Payments Pro: United States, United Kingdom, Canada. The online transaction fees will depend upon the charges specified by Payments Pro. 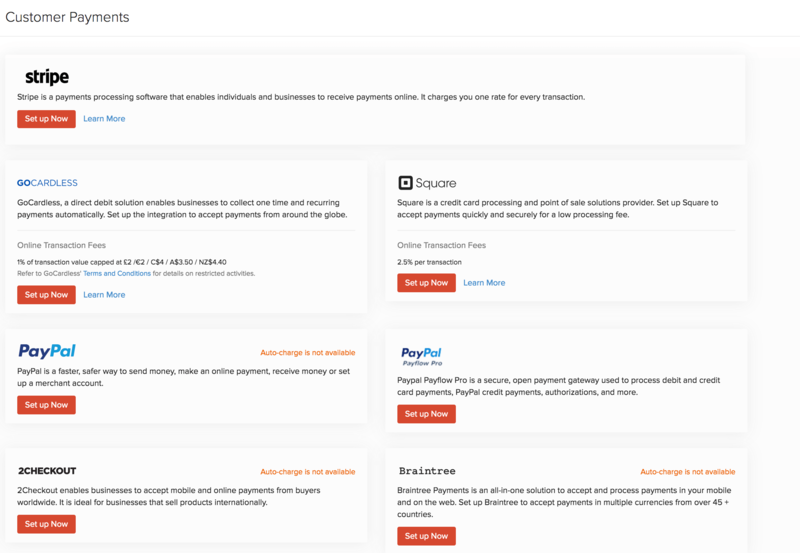 Stripe is an online payment gateway provider that accepts credit cards. To set up Stripe as your Payment Gateway, click on the Gear icon found on the top right hand side corner of the screen. 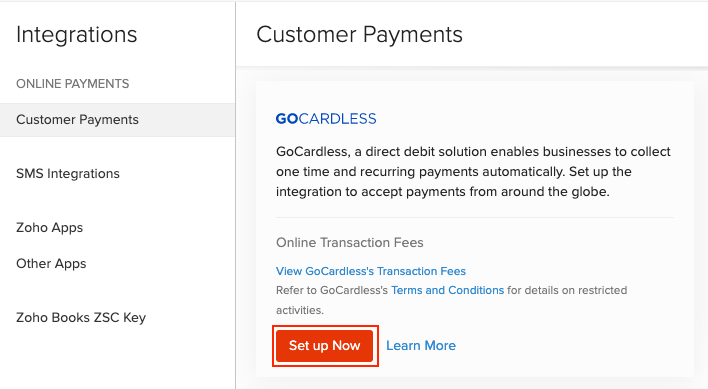 Go to Integrations and select Online Payments and click the Setup now button, listed adjacent to Stripe logo. Enter the following information and click Save. API Key: You will need to enter your API Secret Key for the integration to work. To find your API info, log into your Stripe account and click on Your Account -> Account Settings -> API Keys. Tip - Countries supported by Stripe: Australia, Canada, Ireland, United Kingdom, United States, Belgium, Finland, France, Germany, Luxemberg, Netherlands, Spain, Denmark, Norway, Sweden. To configure 2CheckOut, click on the Gear icon found on the top right hand side corner of the screen. Go to Integrations and select Online Payments and click the Setup now button, listed adjacent to 2CheckOut logo. Enter the following information and click Save. 2CO Account No: Enter your 2CO Account no provided to you. 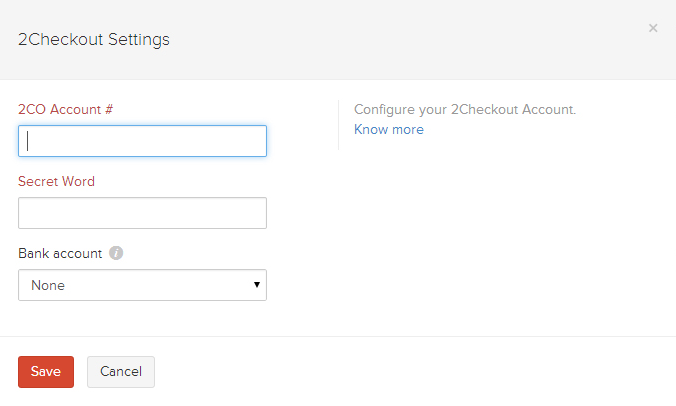 Ensure that you configure your 2CheckOut account by logging in to the 2CO control panel. Read the details on how to configure by clicking on Know more on the right side of the screen. Secret Word: Enter the Secret word (Password) here. If you haven’t created a 2Checkout merchant account yet, click here to sign up now. 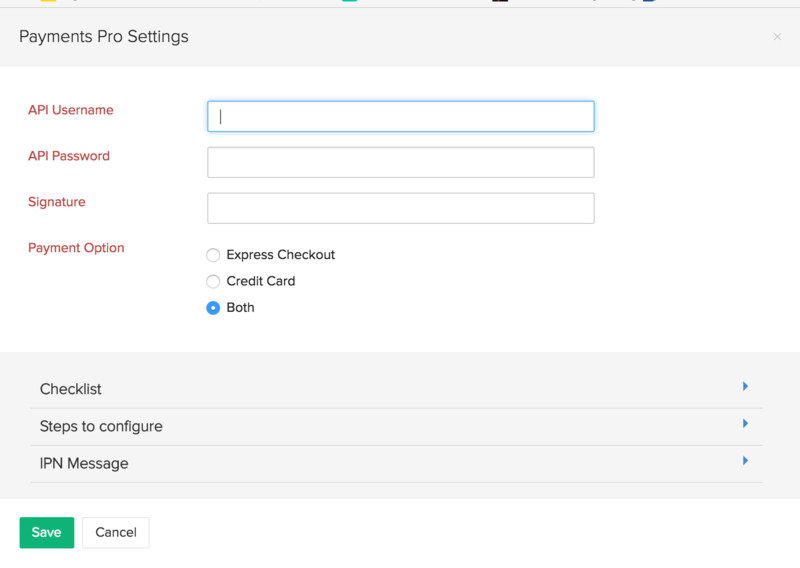 When you setup the integration, your 2CO Account# and Secret Word will be shared with 2Checkout. Tip - Countries supported by 2CheckOut: Supports all countries except North Korea, Iran, Sudan, Syria, Cuba, Myanmar (Burma). The online transaction fees will depend upon the charges specified by 2Checkout. To configure BrainTree, click on the gear icon on the top right hand side corner of the screen. 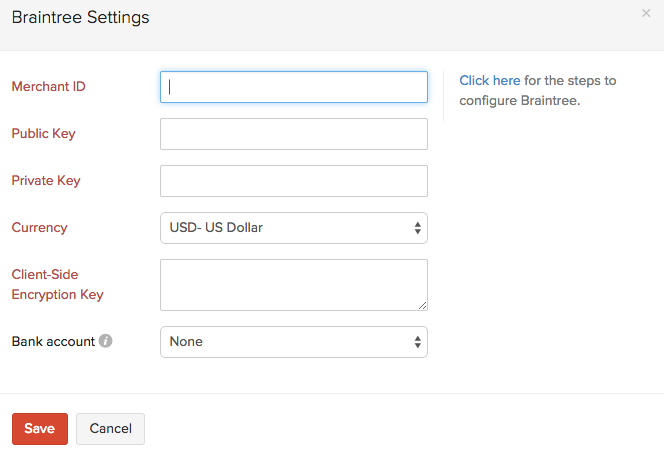 Go to Integrations and select Online Payments and click the Setup Now button adjacent to Braintree logo. Enter the following information and click Save. Public Key: Enter the Public Key here. Private Key: Enter the Private Key here. Currency: Select the currency in use in your BrainTree account. BrainTree currently supports transaction in 8 leading currencies. Client Side Encryption Key: You will need to paste your Client side Encryption Key here. To find this, log into your BrainTree account and click on API Key section provided on the right pane. When you setup this integration, the fields mentioned above will be shared with Braintree. Tip - Countries supported by Braintree: Works for United States, Canada, Europe, Singapore, Hong Kong, Malaysia, Australia, and New Zealand. The online transaction fees will depend upon the charges specified by Braintree. To set up Forte, click on the gear icon on the top right hand side corner of the screen. 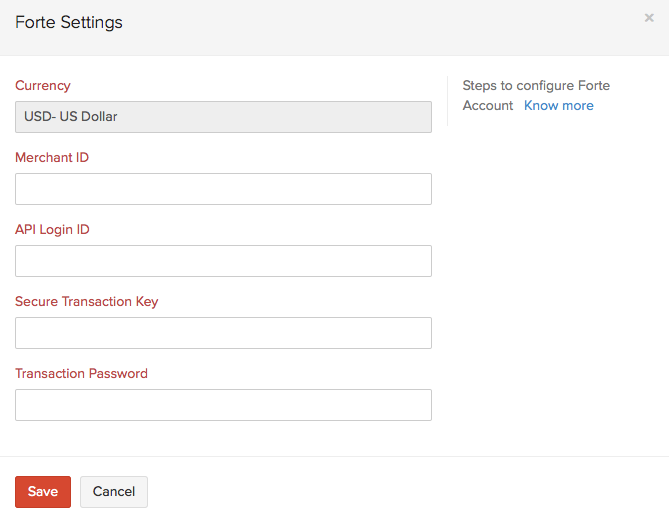 Go to Integrations and select Online Payments and click the Setup Now button adjacent to Forte logo. Enter the following information and click Save.. Forte only supports the USD currency. Merchant ID: Enter your Forte Merchant ID. API Login ID and Secure Transaction Key should be the same as in the Forte Virtual Terminal. You can find your API Login ID and Secure Transaction Key by logging into your Forte Virtual Terminal and selecting Gateway Settings > Gateway Key. Transaction Password: Enter the transaction password provided to you by Forte. When you setup this integration, the fields mentioned above will be shared with Forte. Tip - Countries supported by Forte: United States, United Kingdom and Canada. The online transaction fees will depend upon the charges specified by Forte. To setup World Pay payment gateway, follow the below steps. 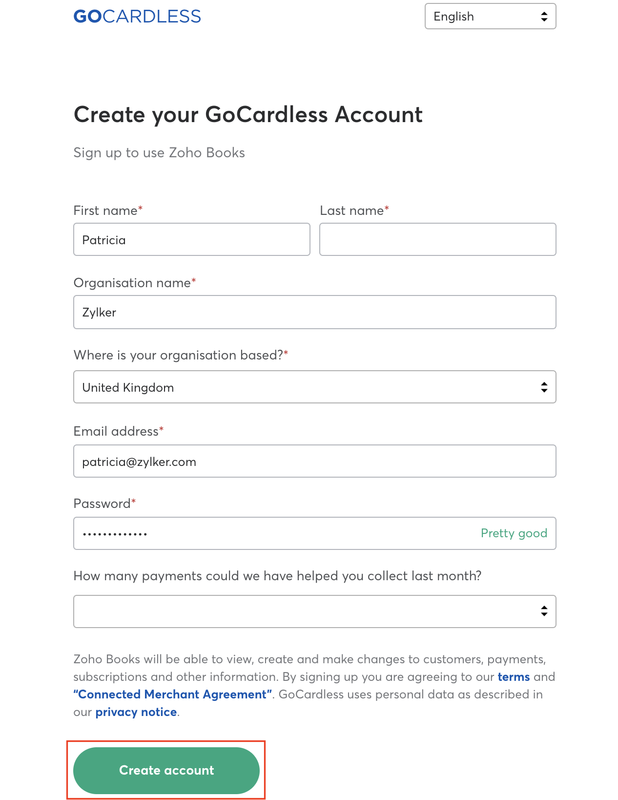 Also note that Zoho Books supports only corporate gateway accounts. Click on the gear icon on the top right corner and select the Integrations option. Go to Integrations and select Online Payments. Click the Setup Now button right adjacent to the World Pay logo. Ecommerce Merchant Code and Ecommerce XML Password should be the same as in the World Pay Virtual Terminal. Login to the Worldpay Virtual Terminal. Click on ‘Select Merchant Code’ and choose your Ecommerce merchant code. Click Profile on the left navigation pane and copy the Merchant Code, XML Password to this form. Pay As Order Merchant Code and Pay As Order Merchant Password should also be the same as in the virtual terminal. Click on ‘Select Merchant Code’ and choose your Pay As Order merchant code. 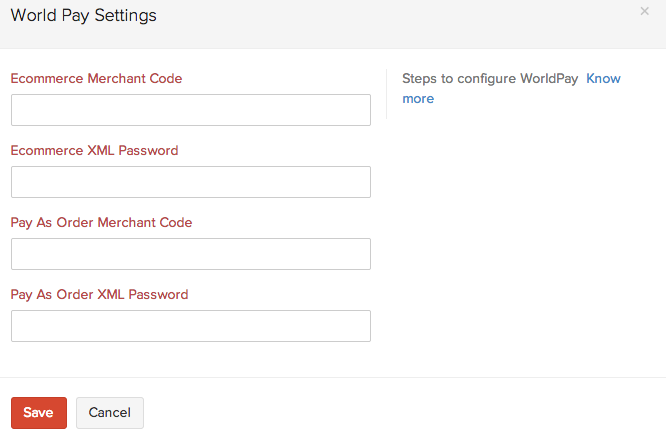 When you setup this integration, the fields mentioned under Worldpay Settings will be shared with Worldpay. Tip - Countries supported by Worldpay: United Kingdom. 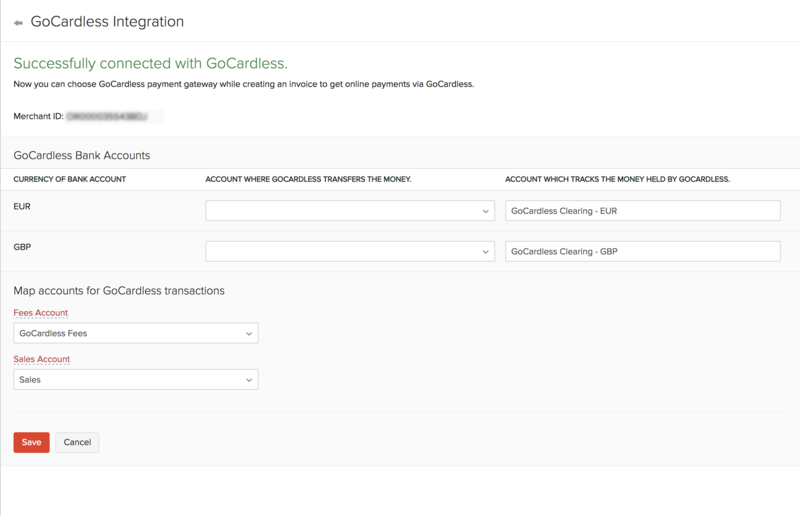 Setting up an integration with GoCardless will enable your customers to make payments through the Client Portal. 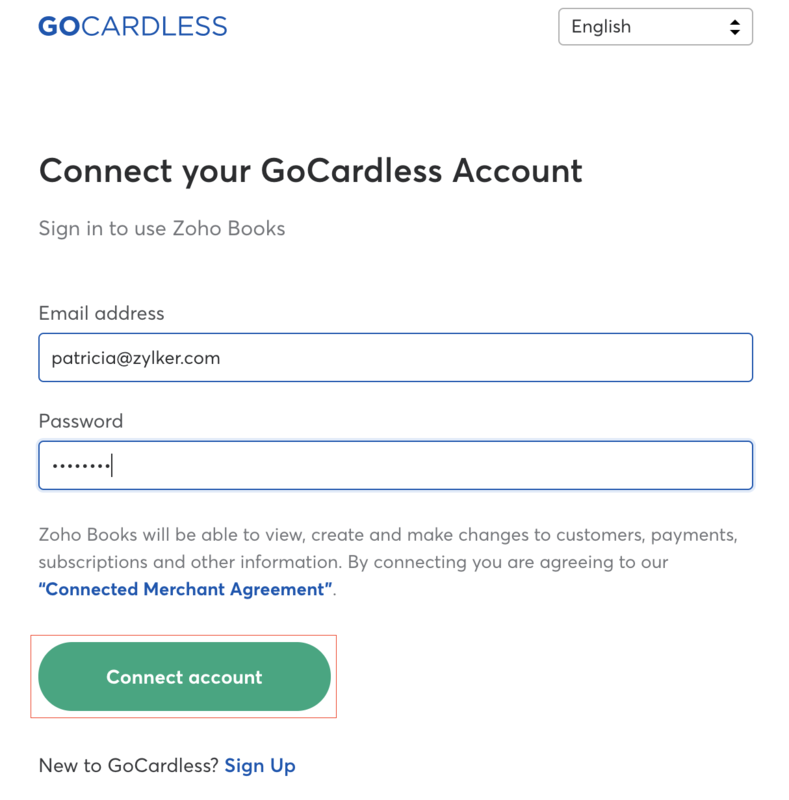 When you setup this integration, an access token will be shared with GoCardless. 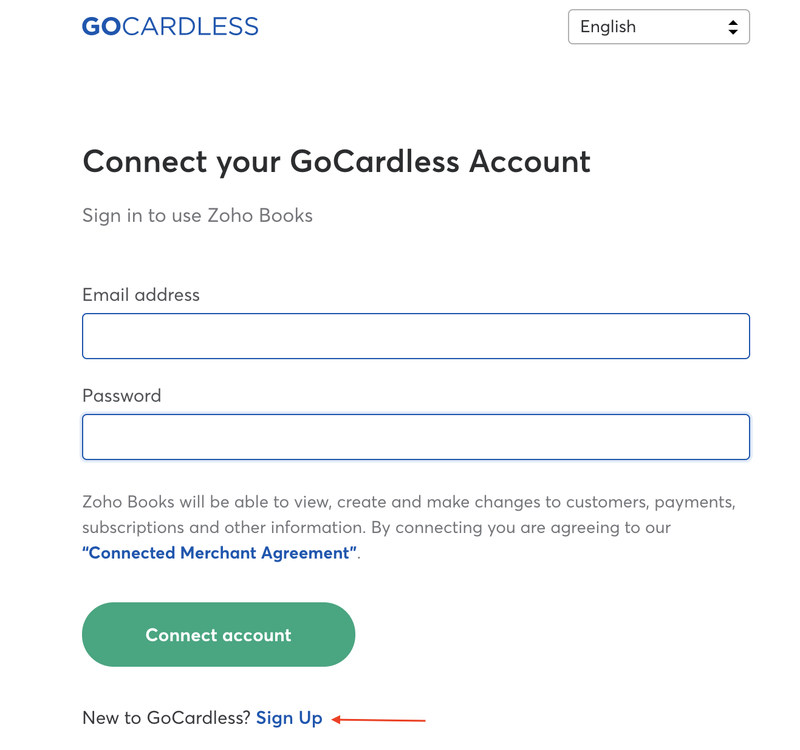 Making payments through Client Portal using GoCardless. Initially card address was made mandatory in Zoho Books. This was initiated by us to avoid confusions with respect to various payment gateways as different payment gateways have different validations. But now you are given that option to decide on whether the card address needs to be shown or not. Depending on your choice of gateway you can enable the necessary fields of the card address to be shown or to be made mandatory by making the preferences in Card Verification Settings. Click the Gear icon present at the top right corner of the screen. 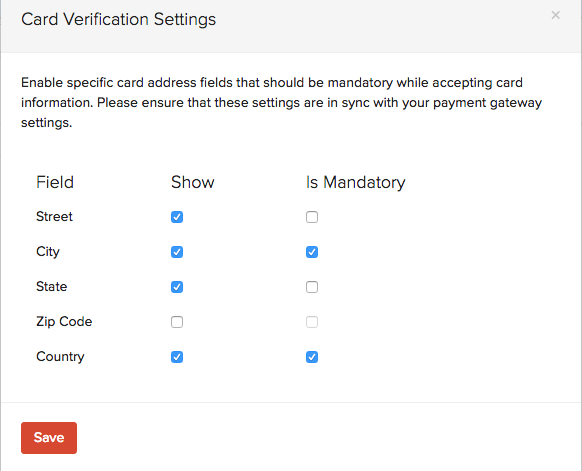 Go to Integrations and select Online Payments and click the Card Verification Settings button. Here you can customize card address details accordingly. Zoho provides numerous world class apps in addition to Zoho Books, such as Zoho CRM, Zoho Invoice, etc. If you have a Zoho CRM account and would like to integrate with your Zoho Books or Zoho Invoice account, you may use this ZSC key to do so. The ZSC Key is a unique key used to communicate between these apps. Navigate to Settings -> Integrations and select Zoho Books ZSC Key, to get the key or to generate a new one. Click on the Regenerate ZSC Key link provided on this page, to generate a new ZSC key. When cards are used for payment, the payer’s card information will be encrypted and passed to the payement gateway. 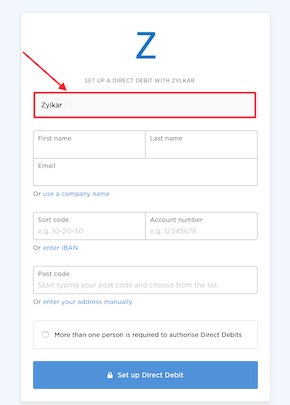 After the payment is processed and confirmed, the last 4 digits of the card along with the month and year of expiry are stored in the payment details section of Zoho Books.